Construction at a Chinese eco tourism zone is believed to have caused the death of 6,000 critically endangered Chinese sturgeon. A bridge in Hubei province was being built close to a farm on the Yangtze river which was breeding the long-living fish. A Chinese news site said the deaths were "directly linked to the shocks, noises and changes of water sources". All work has been halted while investigations are carried out. 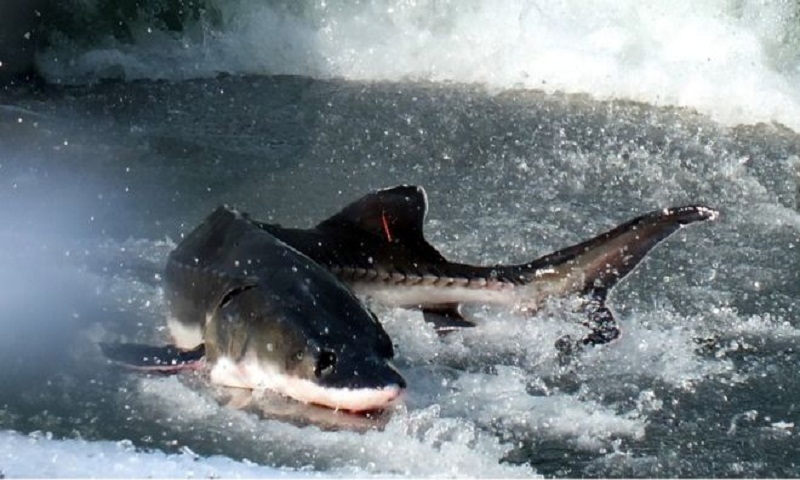 The Chinese sturgeon species dates back more than 140 million years. Individual fish can grow to up to 5m (16ft) in length and can live for up to 60 years, but will only spawn a few times during their life. The species is on the brink of extinction in the wild because of pollution, overfishing - for their meat and roe, sold as caviar - and environmental changes like the vast hydroelectric dams which span the Yangtze, blocking access to their spawning sites. China launched a breeding programme in the 1970s to save the species and there are now thought to be about 1,000 adult fish in the country. The Hengshang aquafarm near Jingzhou was a vital part of that programme. But since the start of the year, more than 6,000 baby sturgeon have been reported dead there along with 36 fish aged 20 years or more. The fish are known to be very sensitive to noise and disruption and news site thepaper.cn quoted officials at the farm as saying the fish had been distressed by the nearby construction, occasionally leaping out of the water. Chinese news site Thepaper.cn quoted a fisheries scientist as saying the adults that died had been "extremely precious" as they were directly descended from wild sturgeon. The Ministry of Agriculture and Rural Affairs launched an investigation and found construction of the bridge had intruded illegally on a nature reserve, China Daily reported. It quoted a ministry official as saying that anyone found responsible would be held accountable under the fisheries law.